Super Clean Classic 1951 Beach Cottage with filtered views of the rock. This single level 2 bedroom 1 bath home has been very well cared for with an updated kitchen and bath, bonus room, formal dining room, original wood floors, a wood fireplace, dual pane windows, Ikea master closet, dishwasher, washer, dryer, refrigerator included. Beautifully landscaped, low maintenance fenced yard with some rock views, private back yard and patio area. Also featured is a single car garage, a carport and a long/wide driveway with plenty of extra parking. 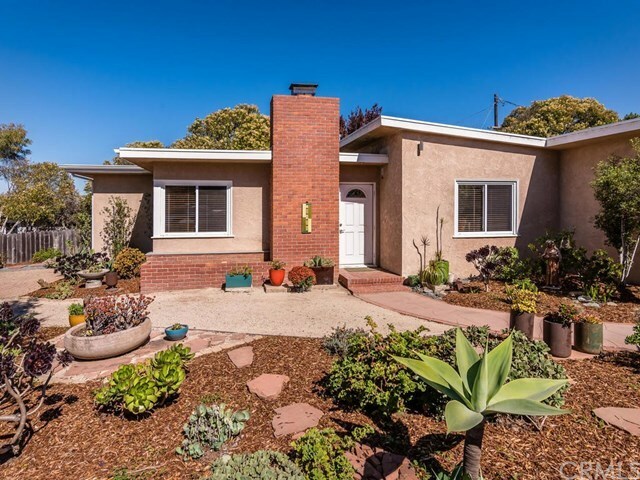 Located in the upper Morro Heights neighborhood just blocks to the Black Hill Trail Head at the State Park, close enough to walk downtown, to Embarcadero or to the golf course. This single level home is super comfortable and could be expanded very easily. Information not verified. Directions: Kern to Pecho, right on Carmel St. Home is second drive on the left.